When the UW’s medical school gave Tim Cordes a chance, he exceeded expectations, teaching others that being blind needn’t destroy one’s dreams. 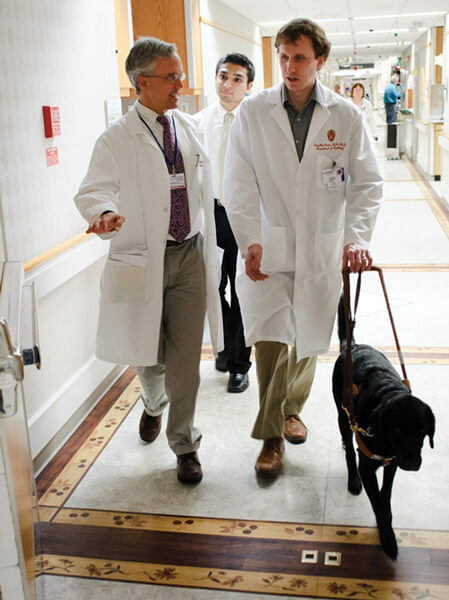 With guide dog Bella leading the way, Tim Cordes talks with physician Michael Peterson, left, and medical student Dhaval Desai, behind, as they do a morning round of patient consultations at UW Hospital. A morning in the trenches of the Psychiatry Consultation Service at UW Hospital is like a visit to a MASH unit of the mind. Medical students scurry out the door to evaluate hospitalized patients who are suffering from both psychiatric and medical illnesses, and then return with their observations. When medical student Tabatha Williams MDx’12 describes a patient who attempted suicide after her painkiller prescription was not renewed, Tim Cordes MD’04, PhD’07 reacts with concern. While the patient is insisting on going home, both student and doctor worry about another attempt. “If nothing at home has changed, and she has no support, why would we expect things will be better?” asks Cordes, as he uses a computer voice program to navigate Google. He’s looking for a social worker or police officer in the woman’s hometown, someone who could ask a judge for an emergency hold and keep her hospitalized for another three days. He signals for his guide dog, Bella. Then dog, doctor, and students set off through the maze of hospital floors to see the patient. “See the patient” is an inadequate phrase when applied to Cordes, who has been blind since boyhood. Yet colleagues insist that Cordes, who has an outpatient caseload of about one hundred and thirty patients and oversees psychiatry interns at two hospitals, has unique insight into the minds and bodies of his patients. Williams, a third-year medical student, says that Cordes is an adept listener who picks up things from his patients that others rely upon body language or other visual cues to identify. For instance, she recalls, he can realize that a medication is creating side effects based on the sound of a patient’s voice. 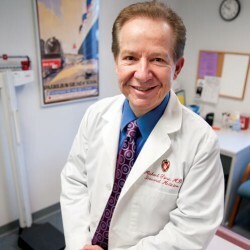 Dean Krahn MD’80, chief of psychiatry at the William S. Middleton Memorial Veterans Hospital (VA), says that Cordes “does excellent physical exams.” Using just his sense of touch, Cordes has discovered potentially life-threatening blood clots that others had missed. 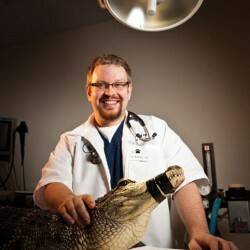 But more important, Krahn says, is his ability to connect with his patients. At the VA, Cordes streamlined the process of getting a psychiatric consultation so that patients could be seen more quickly, and he is currently researching better ways to deliver addiction treatment to military veterans in rural areas of Wisconsin. This fall, he will begin a fellowship in addiction treatment at the veterans hospital. 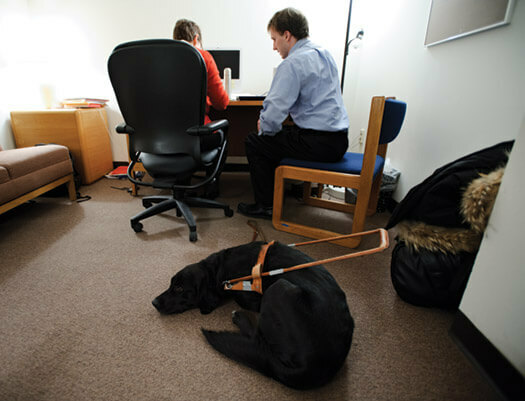 As guide dog Bella patiently waits, Tim Cordes reviews patient records and dictates notes, working with Liz Morrison, a retired nurse and one of Cordes’s visual describers. Tim Cordes was just a toddler when his mom, Therese, heard from doctors at the University of Iowa that her son had a rare genetic condition called Leber’s disease. He will eventually lose all of his eyesight, and he will never drive a car or pilot a plane, they said. And they told her to think seriously about putting him in a special school for blind children. As Cordes gave his speech to an audience of about five hundred last year, his mother sat at a table up front, with his wife, Blue-leaf Cordes ’97, PhD’04, MD’06, and their two young sons, Peter, now four, and Paul, one. Just one of Cordes’s many achievements would make most mothers glow. He earned black belts in jujitsu and tae kwon do, composed music, learned to water-ski, and carried the Olympic torch in 2002. Cordes graduated as valedictorian of his Notre Dame class in 1998, after earning a degree in biochemistry and doing research on antibiotics. Then he encountered another group of people who told him he couldn’t achieve his next dream: going to medical school. Although he had a resume that would make anyone else a shoo-in, eight medical schools rejected him. Only the Wisconsin School of Medicine and Public Health gave him a chance — and then only after some rather intense debate by the admissions committee. But Cordes persisted, plunging his hands into cadavers to pull out and feel the organs, and earning kudos from surgeons and anesthesiologists alike. All praised his intense preparation, which allowed him to place a tube in a patient’s windpipe correctly the first time. In his third year, he won “student of the year” honors from both the obstetrics-gynecology and anesthesiology departments, meaning he was the top student out of one hundred and fifty in those rotations. Wisconsin made a number of modifications for him. The school supplied an Optacon, a machine that converts visual images into raised lines, and a computer that reads notes at a frenetic clip of five hundred words a minute. The Iowa Department for the Blind, from Cordes’s home state, hired “visual describers,” assistants who went through the clinical rotations of medical school with him, describing what they saw and fulfilling duties such as guiding him into the operating room while he held his sterile hands aloft to avoid contamination. They also accompanied Cordes through his stints at rural and specialty clinics, including neurology and family practice. And when he was on twenty-four-hour call at the hospital, they slept there, too. Liz Morrison, one of the visual describers and a retired nurse, was there the night Cordes delivered his first baby. The delivery went fine, except that Vance, Cordes’s German shepherd service dog, wanted to be in on the action. “Basically, Tim delivered the baby and I held back Vance,” says Morrison, who still works part time with Cordes, helping him fill out medical paperwork for his patients. But what Vance lacked as an obstetrical assistant, he more than made up for during Cordes’s psychiatry residency. Krahn, at the veterans hospital, recalls that he initially worried about Cordes’s vulnerability, because residents can encounter seriously mentally ill patients who can be unpredictable, and occasionally, violent. He needn’t have worried. “Vance was the second-best observer in the room when it was Tim, Vance, and me,” says Krahn, who ranks Cordes first. He said the dog was “uncanny” at being completely alert to any unusual movements in a room, while looking like he was totally at rest. But medical school, followed by residency, was hard on the old dog, who wouldn’t eat when he was at the hospital because he knew he was still on duty. Vance retired in summer 2010, and now lives with Cordes’s parents. His new dog, Bella, a young golden retriever-Labrador cross, has a decidedly different therapy style. She bangs her tail enthusiastically on the floor whenever people enter the room. And when Cordes gives her the hand signal, she rubs her head on his lap, giving him a full body wiggle of affection. 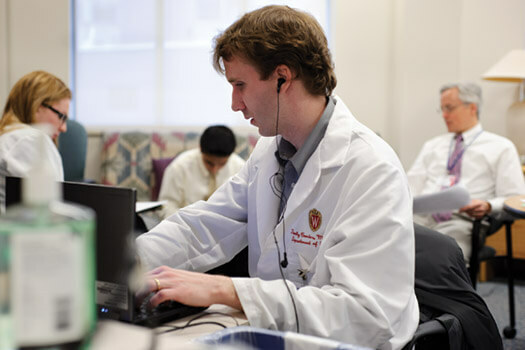 With earphones in place, Tim Cordes listens to computer-translated audio of medical charts as he and a medical team at UW Hospital discuss that day’s caseload of patient consultations. Cordes is a classic Midwesterner, with a low-key style that seems at odds with his drive and accomplishments. So let the numbers tell the story: he was selected for one of 140 spots in the UW medical school from a pool of about 2,300 applicants. The MD/PhD program is even more selective, admitting just eight out of 200 applicants. When Cordes earned his PhD in biochemistry, he became one of 139 blind or visually impaired scientists or engineers in the United States earning doctorates, according to the National Science Foundation. Oh, and when he was working on his doctorate, he needed a way to describe complex molecules. Because he couldn’t see them, he wrote a computer program that uses sound — going up and down the scale, and getting louder and softer — to explain the branching arms of a lethal bacterial protein. His software, Tonal Interface to Macromolecules — Tim Mol for short, is available to others who might need it. And his doctoral research helped scientists to better understand the virulence of Pseudomonas aeruginosa, a bacterium deadly to patients with cystic fibrosis. If more students could get help that compensates for their disabilities, they could achieve what he has, Cordes believes. To share that idea, he addressed the 2010 National Federation of the Blind’s convention and contributed a chapter to an Association of American Medical Colleges guide to making medical schools more accessible to students with disabilities. So far, no blind students have followed him at the UW’s School of Medicine and Public Health, but the school currently has two students with hearing impairments: Josh Reiher, who will be in his fourth year this fall, and Steven Tang, who will be a third-year student. To accommodate their needs, the school hired three sign-language interpreters who have backgrounds in health care. Patrick McBride MD’80, the school’s dean of students, says that while it is a major — and expensive — undertaking to work with students with physical challenges, he thinks more medical schools should open their doors because these students teach their peers so many lessons. Dan Albert, emeritus chair of ophthalmology and visual sciences at the UW, is pleased to see the shift in attitudes. He recalls serving on the admissions committee at Harvard Medical School twenty years ago, when, despite the impassioned pleas by Albert and other members of the committee, the school rejected a “dream candidate” because he was deaf. Today Albert serves as a mentor for one of the UW’s hearing-impaired medical students. Given his achievements, Cordes could have gone many directions with his career. So why pick addiction treatment, an area with low levels of success and high levels of frustration? And, Cordes adds, psychiatry needs to do better by people who have addiction issues. In many cases, he says, they are abusing substances because they have untreated psychiatric problems that need attention or because they are in physical pain. Rather than always seeking to “bring the pain down” with narcotics, psychiatrists can help “bring the person up” so the pain is more tolerable, he says. Back at the Psychiatry Consultation Service, Cordes is talking to medical students about having empathy for patients with addiction issues. One student observes that a patient is rejecting any psychiatric care, and seems interested only in “drug seeking” — obtaining another prescription for pain medicine. Cordes tells the students that convincing patients to seek solutions outside of drugs can be the best medicine. “People with substance-abuse issues always think that the solution to their problem is in the next pill,” he says. “Sometimes we have to help them take a step back. With time and support, they can learn to develop a different relationship with their pain. Cordes’s patients see that compassion — along with a gift of intellect — in their doctor, a young man who was told repeatedly that he should give up on his dream. Susan Lampert Smith ’82 is a senior media specialist for UW Health Public Affairs.